1. This post by Hadassah is a day old, and it started out as a simple, fairly personal post. Somehow the post has taken on a life of its own and is up to 76 comments, as of right now, with a fascinating discussion of priority in spending. 2. Tzedek-Tzedek on whether Motti Borgers suicide will make any difference..
4. Tzvee on the Talmud and the art of motorcycle maintenance. Whoa... Did the Vilna Gaon really say this? That construction on the Third Beis Hamikdash will begin upon the completion of the contruction of the third completion of the Hurva shul on the Old City? As the Hurva Shul is nearing its completion, and is scheduled to be rededicated on March 15th for the third time, the Gra's prediction means that on March 16, 2010 construction on the third Beis Hamikdash will begin. Interestingly, looking at a calendar will show you that March 16 is Rosh Chodesh Nissan. We know that the gemara says in Nissan the Jews were redeemed [from Egypt] and in Nissan the Jews will again be redeemed. I never know how to relate to such predictions, but here at Life in Israel we wish it will come true, b'mehaira b'yameinu..
Join the army, get married! Only in Israel where everything is heimishe, even the non-religious are more heimishe than they are outside of Israel, could this happen. The army unit of Netzach Yehuda, a.k.a Nahal Haredi, has found a way to attract new recruits. They have hired the services of a shadchan to help set the soldiers up with dates to find their soul mate! This actually is meant to make up for the fact that in the haredi world having served in Nahal Haredi has come to lower (whatever that means) a persons prospects in the shidduch scene. While in the general society the more or higher one serves in the army the better the "shidduch" he will be offered, in the haredi world it is the opposite. this is just a few days after the headlines were how they are keeping everything quiet because too mucyh publicity harms the deals. So which is it? too much publicity or too much censorship? or is it whatever is against the newspapers interests?? ...I wish that they would have children and increase. Today, they have a hostility to having children, so they should start having more children. There should be unlimited child-births. The greatest calamity is that they limit their child-birth. They should bring children - and we will manage with them. They can also do teshuva. 2. Torat Yisrael hosts Haveil Havalim #245.. His first hosting of HH..
3. Joe Settler on Bibi's settlement freeze..
4. A Mother in Israel on letting kids walk to school alone..
5. Parshablog's Thanksgiving post on whether the Pilgrims wore tzitzit or not. 6. Not Brisker Yeshivish mentions some of the things we have to be thankful for.. The haredi groups are upset about the secular protest against religious coercion this past shabbos. R' Goldknopf, head of the rabbinic committee for guarding the sanctity of shabbos, doesn't understand them. He says we are all Jews, and how can they protest for chilul shabbos. We all heard the same commandments to keep shabbos. "I don't understand how any Jew can protest against the shabbos". That might actually be a large part of the problem. They don't understand. The secular are not protesting against shabbos. They are protesting against people who are trying to enforce their way of life on others who do not want to be bound by that lifestyle. The seculars say you keep shabbos and leave us alone. The seculars are not protesting against shabbos, at least not most of them (perhaps there are some more extreme secular who are, but that is not true for most of the secular). They are protesting against the haredi coercion. This lack of understanding is also the source for the shock the haredim have expressed that religious people took part in the protests. They do not understand that the protest was not against religion or against shabbos, but against religious coercion. Perhaps if we would spend less time protesting and fighting, and more time listening to the other side and understanding their concerns (this applies to both sides of the protest lines), it would be easier to come to agreements and arrangements.. The court issued a stop order on the tenders and set a date for 2 weeks from now for hearing the two sides of the argument. I stioll don't understand the argument of Mafdal and why they think the court will support them in stopping the tenders from continuing. I see no reason for the courts to get involved, no matter how right the Mafdal's position might be, and I see no basis for the courts preventing any specific group from being awarded the plots for construction or for the courts to legally stop or allow any specific group from buying in any specific area. Regardless of that, the mayor and his supporters have been giving interviews since the court announcement. They have been saying the expect nothing but minor delays, as the courts will uphold the city's position. That remains to be seen, but what was interesting is that Yaakov Litzman announced that it turned out to be a good move that Gur signed with Shalom Lerner before the last elections. The reason why it turns out to be a good move, Litzman says, is because that agreement they signed back then will now serve the city well in presenting their case before the court. They will show that Lerner agreed to give the whole RBS 3 to the haredim, and therefore has no right to make any claims now about giving too much to the haredim. 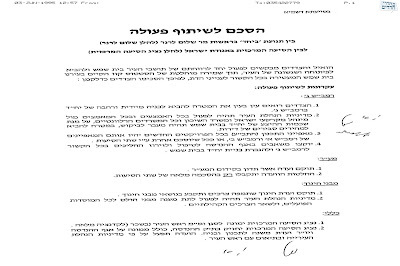 Perhaps the understanding of the document below can be disputed, but the fact is that in the signed agreement below it does not say that Lerner agrees RBS 3 will be given to the haredim. 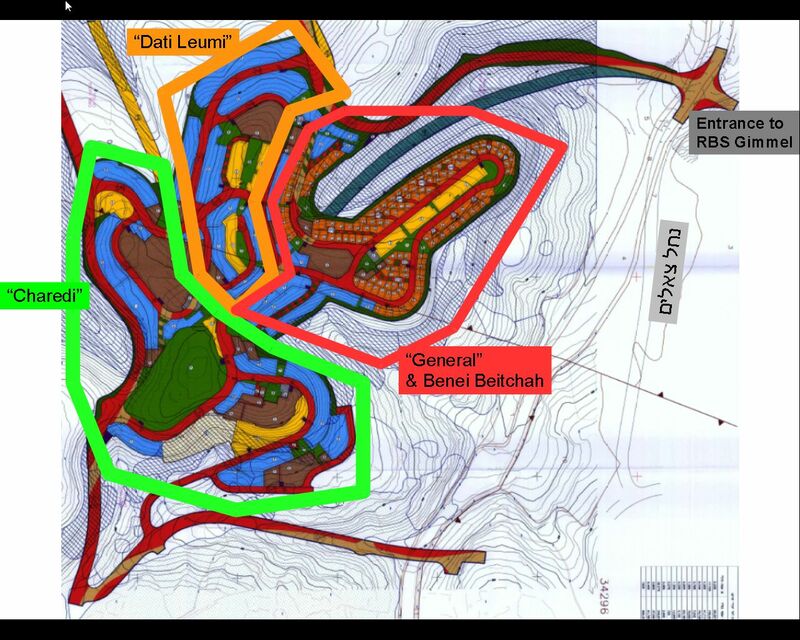 It does say that they both agree that the Taba - the construction planning registered with the Israel Lands Authority, will be the same as RBS A and RBS B. A statement like that is extremely vague, but it does not mean the haredim, or specifically Gur, will get everything. The fact that RBS A was bought out by about 40%-60% (depending which numbers you believe) over time does not have anything to do with the registration in the Lands Authority. The gareement was per the registration. RBS B was registered and planned as haredi, but RBS A was registered and planned as "Klali" - for the general population. 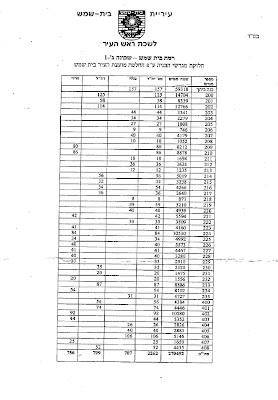 Perhaps Litzman is looking at the final results of who bought, and see RBS A as haredi even though it is mixed, and is therefore understanding the document that the Taba of C will be haredi just like RBS A and B turned out. But the agreement is only on the Taba, comparing it to the Taba of A and B - not comparing it to the final population mix. Rav Yisroel Schwartz is the dayan of Kehillas HaYeraim in Yerushalayim. Rav Schwartz lost his wife in a terrorist attack - the bus bombing of the Number 2 bus on Shmuel HaNavi street in 2003. Bechadrei went to Rav Schwartz to ask him his opinion on a possible deal to release terrorists in exchange for Gilad Shalit's freedom. I sat with Rav Schwartz a few times in the past, and I know Rav Schwartz to be a very straight person with halachic considerations at his consideration at all times. I know the halacha can be debated, and I understand both sides have valid points over whether or not terrorist murderers should be released. Also, I generally believe that while people who lost relatives have the right to, and should, voice their opinions about such things, the State has an obligation to not listen to them but to do what it feels is right. The families of the victims speak from an emotional position. The State has to do what it feels is right for the country - diplomatically, security, socially, etc. It has a lot more to take into consideration. Rav Schwartz in the video interview supports releasing terrorists in exchange for Shalit. His main halachic argument is the "Bari V'Shema" argument. We know Shalit is in danger. We don't know for sure that the terrorists will do any more damage once released than they already do with these guys in jail. He says that they don't care about specific people - they educate their children to hate and kill us regardless of whether someone is released or not. So it is doubtful whether anything will change if they are released. Therefore, Rav Schwartz holds, it is incumbent upon us to release terrorists to make the exchange. A touching video... unfortunately it is becoming more and more trendy to commemorate the holocaust and its victims in this fashion which is assur....Would the victims want to be remembered in this way? Perhaps it would be appropriate, for the girl who just found out what the number means, to first go read a book or watch a film about what happened in the holocaust? She just found out there was such a thing and she right away romaticizes getting a tattoo - she has no idea what she is even remembering. It seems to be trendy nowadays to tattoo a number on one's arm in commemoration, but what about first studying the history? reading the various books that tell the stories of real people who survived, and of those who did not? 1. Yeranen Yaakov points to a video of Rav Batzri exorcising a dybbuk... for some reason it feels "wrong" that these things are done in public.. By "wrong" I don't mean he did something wrong, but it seems like such publicity, allowing the crowds to watch, etc. make it more of a media spectacle and less believable. 3. Hadassah on the issue of the schools asking for tips for the teachers from the parents.. and Dov Bear on the same topic. Last night was historic, as far as I know, unfortunately. For the first time, that I am aware of, my daughters school had a parents teachers conference and invited the fathers to participate. I say "unfortunately" because if they were already inviting me to come talk to the teachers, there was no way for me to get out of it! So I went. Other mothers were surprised I was there, as I was the only father to show up. By the end of the evening another father had showed up. Is the Kotel going through a process of "haredization"? It depends who you ask. There have been complaints recently by some dati leumi and secular organizations that it is being "haredized". They point to various changes in the Kotel area that indicate new rules are being implemented. The flags at the back of the plaza were removed, signs calling for separation of the sexes were placed around the plaza area, stationing of tzniyus guards around the area, disallowing civil ceremonies ni the plaza above the kotel, along with some other examples. After sending protests and complaints, some of those have been rescinded. The flags have been returned to the back of the plaza. most of the signs calling for separation of the sexes have been removed from the plaza area. The various organizations claim that their protests and complaints have helped and they say they plan to continue complaining about various other examples of what they call the haredization of the Kotel until it is all resolved. Rav Rabinovitch has an answer for each of the claims, as he denies there is any such haredization going on. The flags, Rabinovitch says, were removed due to renovations going on in the area. The renovations have been completed, so the flags were returned to their places. Separation, he says, was never demanded in the plaza area, except during special prayer gatherings (where large crowds were expected) - one sign remains on a partition that had been erected for construction purposes and that will soon be removed. Basically, it is a figment of their imagination, and is all just a matter of coincidental timing, according to Rav Rabinovitch. Another example has come to light, this one far more serious. Yediot Acharonot has published today an article (I saw it in the newspaper but not yet online) claiming that haredim at the Kotel are destroying siddurim, specifically Rinat Yisrael, that contain the prayer for the State of Israel. They are ripping the pages that contain the prayer. They showed pictures of some siddurim that were torn on said pages. I find it hard to believe that haredim would do this - tear a siddur. At least not as a group or as a directed project. Perhaps there are some hotheads who might consider such a prayer to be heretical and maybe they do it on their own, but as a group, as part of a ploy to haredize the kotel - I don't believe it. Of course such people should be prosecuted, if they are caught, and steps should be taken to prevent it from happening. But to consider that as a directed attempt to change the status of the kotel is too much for me to believe..
Do you love meeting with people but can't stand booking the appointments? Have you ever shown up to a meeting but the other person wasn't there (because neither of you confirmed)? There is a solution for you! An American virtual executive assistant from Secretary in Israel can make and confirm all of your appointments for you using Google Calendar, Entourage, or Microsoft Outlook. Never again miss a meeting or waste another minute booking your own appointment! Learn more about their American virtual executive assistants and the services they can help you with. In Lakewood they are full of technological advances. Now they have devised a new venue for shidduch dating using technology. This whole thing makes no sense to me. Aside from the general stupidity of arranging for people to meet like this, except in cases where girls and boys are in different cities and don't know whether to travel or not for a date, I thought in Lakewood, and other communities this is obviously going to be targeting, people are not meant to be using Internet? Do they get this set up in their homes when a date is arranged or do they have to go to a center? If they have to go to some office, then this system will only be usable in a few areas by few people - or will they set up an office in every city in the world with a Jewish community? The best thing about it is that now people will be able to go out on dates, feeling formal, but without the actual formality. They can wear the top of their suits - jacket shirt and tie, but sit in their shorts, pajamas, or even underwear for comfort! Another result of the Eidah hafganot against Intel is now going to be a counter-hafgana being planned against religious coercion. The best part of it is the name they are using for their group - "Tzioni Yatzrani", which would mean "Creative Zionists" or perhaps "Productive Zionists". I never heard this one before, and I assume it was created for the marketing of this protest..
Yuri Foreman winning the super-welterweight boxing title while being called a rabbinical student has sparked a debate of whether it is permitted to box, considering the inevitable damage done to the body, or not. While he hears criticism about his profession from some in Brooklyn's Jewish community, Foreman, 29, said, "People who have never been in the ring, never done what I do, they're sometimes really quick to give their opinions. "They like to say what's forgiven and what's forbidden...but it's not so simple." The 29-year-old Foreman, who lives in Carroll Gardens and trains in Gleason's Gym in DUMBO, has a record of 28-0. He's also been a part-time rabbinical student for the past three years, even though it is widely held that a rabbi shouldn't be a professional fighter. "I don't think it's even a debate among rabbis," said Sid Leiman, a professor of Jewish history at Brooklyn College. "Rabbis would look unkindly on [boxing]; if it's not against Jewish law, it's certainly against the spirit of Jewish law." "The wrong way of looking at this is to say, 'He's an observant Jew and he's boxing so it's okay,'" said Rabbi Yaakov Osdoba, 40, a seminary instructor in Crown Heights. "The point is, even though he's observant it doesn't justify [boxing]." Foreman doesn't buy the criticism, saying portions of Halakhah, Jewish law, provide justification for the sport he not only loves, but one he feels brings him closer to God. "Look, if you ask, just boxing, any rabbi who doesn't know boxing is going to give you an answer right away," he said. "But when you're in the ring after five rounds, going on 12, it's very spiritual, and I'm saying my own little prayers throughout the fight, 'Please, God, protect me.'" Some groups say, and I thought Chabad was one of them, that when people become frum they should not give up their old life and old jobs. Rather, they should continue in their professions. They generally believe in living a frum life in all areas. That is how people like Matisyahu come to be and thrive in Chabad, and that is how young boxers like Foreman and Salita have succeeded as well. It is strange that some rabbis are now giving statements like this that rabbis, or Jews for that matter, should not be boxers - I do not know if these are rabbis who have influence over these young men or not. In reality nobody should be boxers. Why would anyone want the brain damage that will result from getting your head pounded on repeatedly for a number of years. But once the guy is already in this profession and loves it and sees his life there, I don't see it to be any worse than somebody involved in other high risk jobs. Risk and potential future damage are very subjective and what some consider to be risky others consider to be lame, so it should be very difficult for anyone to tell someone else he can or cannot do something because of the risk involved. Boxing is probably pretty risky according to everybody, but what about other risky ventures like being a window washer by a skyscraper? What about being a dog trainer? a policeman or fireman? a soldier in the army? 1. Between JM and TLV on between life and death - the guy in a coma for 23 years who now says he was conscious the whole time. 2. Aussie Dave has a picture that he holds up in Ahmadinejad's face. 3. Mystical Paths describes the evil town of Gilo..
5. Benjie went to the Gilad Shalit tent and describes what he experienced. Hopefully the tent will soon be closed down and Gilad Shalit will be home with his family..
After hearing all this talk about building in RBS C/G/3 and about dividing or not dividing it up, you might be curious how it is going to work. 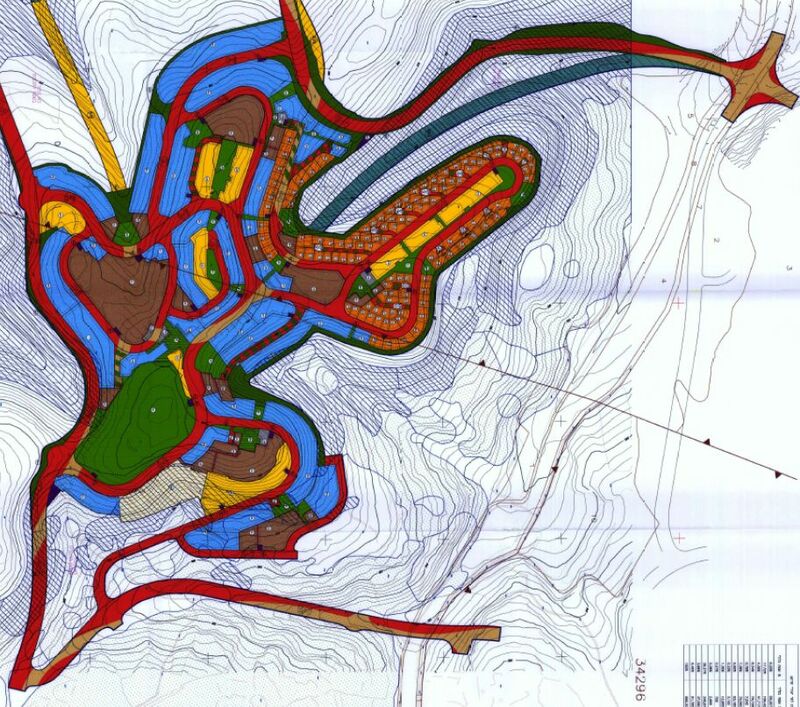 Here are the maps of how the sections will be divided up, according to the original plan at least, and how the plots are being divided and put up for building tenders.. This map contains the basic layout of RBS Gimmel. 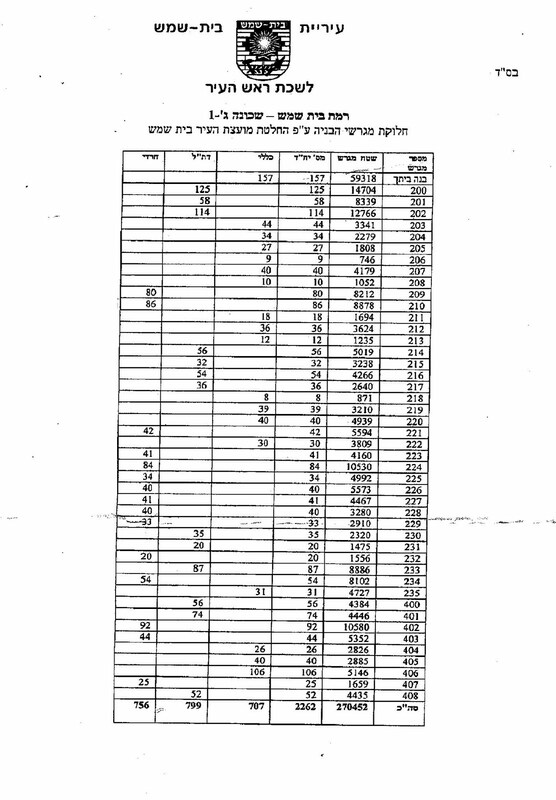 The iryah voted to apportion RBS Gimmel evenly between three groups - Chareidi/Dait Leumi/General. While the Misrad Hashichun did not approve this division, the information was still presented to the interested kablanim as attached. The map shows the basic division and the list shows exactly which areas and number of units are in each section. Mayor Moshe Abutbol of Bet Shemesh chose to hit back at the 2 main newspapers that have been leading the "attack" against him with articles incessantly lambasting him. He published statements in Chadash, his newspaper of choice, hitting back. In his statement, he attacks the newspapers (Keren Or and Shopping Bet Shemesh) saying they have shown themselves to have broken the basic laws of journalism and have lost their objectivity. A newspaper is meant to be objective, so he says, in its reporting, and in its parshanut as well, though in parshanut there is more leeway. These newspapers have gone beyond the objective and have clearly showed their political affiliation and report and analyze the news with no objectivity. It is ironic that he chose to publish this in Chadash. Chadash too is a newspaper with zero objectivity and completely adheres to political affiliation. It happens to be that right now Chadash is in line with the mayor, so they do not attack him. 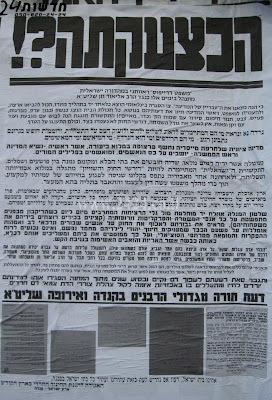 However, in the years before Abutbol was mayor, the Chadash paper attacked Vaknin whenever it felt it was prudent to do so. The Chadash is a clearly affiliated newspaper pulling a very sibjective style of reporting, yet that is the platform used to attack other papers for their lack of objectivity. I don't know how objective any given newspaper is really meant to be (I did not study journalism and do not know the "rules"). I do know that in pretty much every newspaper in the world you will easily be able to figure out the affiliation of the newspaper after reading just a few articles. Abutbol's response was poorly placed, considering the content of his response. And I am not so sure how accurate his claims are regarding what the newspapers are meant to be doing. Funny conversation I noticed during dinner - one of my kids lost a tooth, and we were talking about the tooth fairy. At the same time, my mother who is still here visiting was talking with one of my kids about red strings from Kever Rachel. Israel has no intention of building the Beis Hamikdash on Temple Mount.. Rumors have been swirling about the release of Gilad Shalit being imminent, as a deal is in the final stages of being closed. To this end, Hamas has announced that the current holdup is surrounding an argument over one prisoner - Hamas wants a specific terrorist released and Israel is saying no to that one. I generally have not commented on the rumors, because they are just rumors. We have heard many times already that a deal is imminent and his release is just days away. It obviously has not happened yet, so I take rumors in the media to be just rumors and not worthy of comment. This, however, is not just a rumor, but a statement by Hamas. I am not commenting on the rumor of Shalit's coming release, but on the hamas statement of Israel holding up the deal because of one name. Clearly, Hamas is trying to put pressure on israel by making such an announcement. Most people who hear such a thing will say "One name? one name? that is it? one name, just forget it. throw him in. we are releasing all those others anyway, what is one more?" or something to that effect. Have you ever argued with a taxi driver over the price of a ride, and he will say to you "you are arguing over 2 shekel? ", and then you feel kind of stupid that you are getting all worked up over that small amount. The truth is, and I often will say something to this affect in similar situations, the other guy is also arguing over just "2 shekels" (or whatever the small amount is), so you should feel no less or more stupid than he should feel, (NOTE: despite my saying this, I am a certified freier and generally will be the one who ends up paying the difference), and you have no reason to not argue for it just like he feels he has the right. Hamas is doing the same thing. By saying the argument is over one name, they are making us feel stupid, like we are holding up the deal to release Shalit because of one insignificant point in the deal. The truth is, they are holding up the deal just as much, and they should be the ones to forgo that one name, just like they are claiming that we should forgo it. Hamas knows that we are a democracy, and the government has to keep the people happy. If they can make us feel stupid over this, they will have exerted the appropriate pressure, via the average Israeli citizen, on the Israeli government. And by doing that, they will likely get what they want. nobody wants to feel stupid. If you are from Bet Shemesh, you might be aware that the haredi newspaper Chadash recently underwent a major change. The newspaper was sold, as Mati Rosenzweig, the previous owner, had a conflict of interests being that he was appointed to the job of Municipal Spokesperson. Shortly after the sale, the editor of the paper was also changed. In the few weeks since the editor was changed, I have noticed a major change in the tone of the paper. The previous editor always had a column on the first inside page in which he analyzed a lesson based on, usually, something in current culture - a holiday usually or something similar, only vaguely, at most, touching on local politics. In the paper itself, even if the reporting and writing was low quality and biased, at least the tone was reasonable. Since the change, the quality has not improved (yet), but the tone has changed. Almost every article is spent attacking anybody in the city who does not tow the haredi line. The first page editorial has been, weekly, a scathing article against anybody who is not haredi or doesn't vote haredi, mostly against the Mafdal because of recent events, and many articles within are also spent attacking those who do anything other than the haredi position. The quality has not improved, and the tone has gotten worse. I don't like it. It is getting even worse than the stupid attacks of the Keren Or newspaper on the haredim. And that is pretty bad. I hope the turn for the worse is just a case of bad journalism and not an indication of a change for the worse in the general haredi community. I had a number of relatives in town from the US for the recent bar mitzvah. 2. 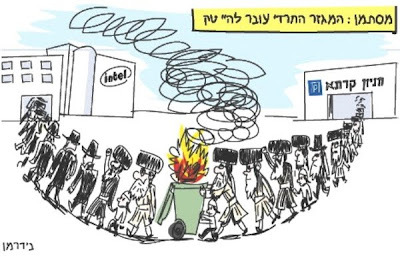 Between JM and TLV discusses the demonstration against Intel. As does Tzedek-Tzedek. 5. A great story about Rabbi Holzberg, hy"d, from India, about how he helped get a get for a woman. 6. Rabbi Fink presents a moral argument against the death penalty. While I know as frum jews we are meant to oppose the death penalty, as who are we to judge someone to death, especially without a sanhedrin and the proper procedures in place. yet I always was in favor of the death penalty, and still remain unconvinced that it is wrong. 7. Modern Uberdox goes "home" and reflects on the changes, and on what has stayed the same. How much did your black hat cost? I don't normally put up obituaries - the death of a personality is a news item that you can get from reading any newspaper, and there is no need for me to mention it. This one sounds unusually interesting, as it seems her life was very unusual and I just want to point it out. 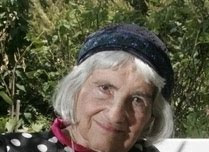 Nomy Frenkel passed away yesterday at the age of 91. Frenkel was an author, who wrote novels depicting what Germany was like with the rise of Hitler to power. What is interesting about Frenkel is the extreme's she brought into her life. She was born to parents who both had religious backgrounds, but themselves had not been religious, and had been socialists. After making aliyah at a young age, after her mother died, she eventually lived on a kibbutz, Kibbutz Beit Alpha, that was a stronghold of Marxism. It seems she did not get along well with the kibbutz, but lived there for a long time. Eventually she joined the navy. At a later stage, in 1982, she changed her spots completely and went to the other extreme, moving to Chevron and then later to Kiryat Arba. 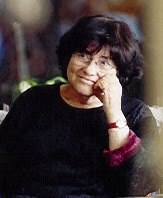 I found this interesting interview from 2004 on Arutz 7, from the B'Sheva newspaper, with Frenkel in which she sheds light on some of her life. The switch from one extreme to the other is what fascinates me. Most people change their views over the course of a lifetime, but the adjustments are fairly minor. Slight lifestyle changes, and even if the changes are great, it is generally only certain aspects of their life, while much of their worldview will remain the same or similar to what it was. Frenkel did not just adjust her life from being a leftist to right wing, but from extreme left to extreme right. At the same time, from secular to religious. And not just staying in Tel Aviv or moving to a religious area, but moving to Chevron-Kiryat Arba. The hafganah of the Eida and its followers against Intel (We should name the weekly Eida Hafgana something like "the what they will protest against next week hafgana") stepped up a notch this week, though the details of that do not interest me all that much. At hafganot, police provoke, protesters provoke, things get hot, people get hit, people get hurt, people get arrested. The Eida is now complaining that the Gaavad got hit in a scuffle and how dare they, but that is part of the risk of taking part in a [semi-] violent hafgana, so no sympathy from me (though the police could have used more tact and avoided the Gaavad). What does interest me is a new phenomenon that is being reported by the Haredim website, That is, somebody spray painted the sheim hamefurash on the street leading up to the location of the hafgana. Some rabbonim who saw it said protesters should avoid walkign there, and it is a problem to erase it as well, so they covered it up with carton so people would not inadvertently step on it. The Gaavad himself said it is not a big deal, as a heretic who writes a Torah imbues it with no holiness, and this would be the same. My point is that this is where the hafganot have taken us. They have done nothing but create fresh hostility and hatred against religion, and they have accomplished nothing in the form of increasing any level of shmiras shabbos by anybody, not publicly nor privately. They are now getting the secular to not just oppose the haredim, but to actually defile the name of God publicly, as a response. Rav Steinman was approached by a longtime educator with a serious question whether perhaps he had been mistaken in his style of education in which he used the old fashioned methods that nowadays we would call being abusive. he hit kids, he spoke down to them, he shamed them into action, etc. Rav Steinman's response is that everything he did was ok, as that was the accepted method back then. He said that today's children are different and those methods can no longer be used. Nowadays, shaming a child does not spur him into action or into improving his behavior, rather it throws him into depression. However, he should not regret the methods he used to use, as at the time they were appropriate, and generally the children of those generations accepted such rebuke and changed. If some children did not, and now they want revenge, Rav Steinman said he should apologize to them and explain that those methods used to be the way of education, but he had no intention to harm them. I believe that the Jewish settlements should be allowed to be expanded upon, because that population of Israel is, is going to grow. More and more Jewish people will be flocking to Israel in the days and weeks and months ahead. And I don't think that the Obama administration has any right to tell Israel that the Jewish settlements cannot expand. Don't the Palestinians still have throwing us into the sea as part of their charter? Remember the ticket I recently got while driving to Bnei Braq? The one with the cop who negotiated with me what to write in the ticket? Well, I followed her instructions and mailed in a copy of my ticket to the traffic police office to be reconsidered and converted to a warning. Today I received in the mail a letter from the police. It says that they reviewed the case, and due to the circumstances, and taking my good driving record into account, they have decided to convert the ticket to a warning. The whole thing was very strange, but I'll take it! Sometimes the system, crazy as it might be, works out well..
Can there really be a shortage of butter at Tnuva or is the makolet guy just pulling my leg? I mean, if you've got milk, can't you make butter? And if Tnuva is short on butter, what about the other dairy suppliers like Tara? According to this, there is a shortage of butter, due to a shortage of fresh milk. Tell those cows to get back to work. We need our butter! Rav Steinman's throwing his support in the Rehovot municipal race to the non-haredi candidate, despite his running against a haredi candidate, looks to me like a good move. A hedge perhaps. The race is very close for the mayorship of Rehovot. The 2 main candidates are a haredi guy from the Likud party (formerly of Shas), and a secular Jew. Rav Steinman told the Rehovot haredim to support Salant, the secular candidate, because the polls said he was leading, and haredim always like to follow the winning horse. Some say Rav Steinman was tricked and was told that Salant is religious. I think it is a good hedge bet. If the haredi candidate, Malul, wins, he is not going to become non-haredi because Rav Steinman said to support the other guy. 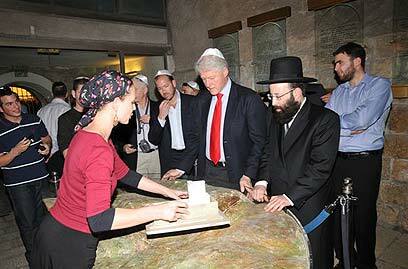 He will still support the haredi causes. Yet if Salant would win without the haredi support, it is possible he might ignore, or at leats not advocate, issues haredim are concerned with. So whoever wins, with Rav Steinman's support behind Salant, the haredim win either way. Finance Minister Yuval Steinitz last week made a statement about how the haredim need to get out and go to work, and the fact that they generally do not, that is the reason for the high levels of unemployment in the haredi comunity. Yuval Steinitz has a pretty good relationship with the haredi parties, and with haredim in general. When he was appointed Finance Minister, the haredi politicians were satisfied, saying that he has always been a friend and supportive of the yeshivas. So, I would not consider any such statement by Steinitz to be based on stereotype and bias. Steinitz is familiar and on good terms with the haredi community, and any such statement is because he sees it as a serious as a problem. MK Moshe Gafni responded saying that it is not that haredim do not want to work, but the government does not want them to. Gafni said the the Tax Authority refuses to certify graduates of Bais Yaakov as tax advisers, even though they have been accredited in a process that ends with exams similar to the regular bagrut (matriculation) exams. Adn, Gafni added, that this discrimination is despite the fact that most people say the haredi women are smarter than others who have gone through the process. I really dislike it when the haredi parties kvetch how everyone is against them. Gafni is saying that the Bais Yaakov girls takes their own exams, not the ones required by the government for certification (I do not know if this is true or not - I know a lot of [mostly female] haredi accountants and tax advisers, so either they went through a different system or Gafni is wrong). If somebody is a private entrepreneur and has a system in place what he requires of job applicants, he also has the ability to go around his own rules and hire somebody he likes, even without the proper background, training or education. It is his own business, and if he finds a particular applicant smarter, or more likable or quicker or whatever, he has that ability. when there is a position that requires governmental oversight, and that position has requirements, people have far less leeway in circumventing the requirements. So Gafni and his buddies want the girls to not get the appropriate education and testing, yet still be accepted for the jobs. Because he says the training is equivalent. Stop kvetching about it and instead of designing your own system that does not meet the requirements, let the girls study the required material and take the required exams. Maybe they are smarter, but that is not the issue. There are requirements for these positions and it is not the governments fault that Bais Yaakov does not meet those requirements. The New York Post article on Yuri Foreman's championship win is very interesting. Foreman is in a rabbinical studies program he expects to complete within two years. He doesn't see his faith being in conflict with his profession. "People have stereotypes that if you've going to be a rabbi then it's got to be only peace: not necessarily," Foreman said. "The life is actually not peaceful. You have to really work hard every day. It's OK to fight and earn money and study to be a rabbi." Hours after winning the title, the accomplishment of a life-long dream had not sunk in yet. It was a dream that began when his mother took him to a boxing gym after he was bullied at grade school -- a dream that helped him become a national champion in Israel while training alongside Arabs; a dream that brought him to Brooklyn at age 19 with the goal of becoming a world champion. "I'm still like, wow," Foreman said, a cut over his left eye and bruise under his right serving a proof his title didn't come without sacrifice. Foreman, 29, hopes his reign will have meaning beyond boxing. "Sport transcends the differences between nations," he said. "When I came first to the Arab gyms, the first impressions were they really stared at me. They wanted a piece of me. But after a few sparring sessions and training they just forget and we become friends. Now I have a lot of Arab supporters. They Facebook me and say they've been praying for me. So it's good to hear." 1. Ima on the Bima has Haveil Havalim #243..
2. Idan Keinan tells us why Ahhnuld Shartzenegger really came to Israel. It has to do with making a sequel to one of his earlier movies... hilarious! 3. Circus Tent asks where the OU has been during the Rubashkin situation. 4. With Hannuka fast approaching, Rabbi Bloomensteil debates an issue of lighting inside or outside, and discusses a psak by Rav Moshe Shternbuch. 5. Between Jerusalem and Tel Aviv unfortunately feel that he has to support chillul shabbat. Personally I think one can oppose the style of the hafganot and still oppose the chillul shabbat... there is no need to specifically support chillul shabbat. 7. Frum n' Flippin is debating whether to go to Germany for a work conference or not..
8. The Zoo Rabbi is looking for help in buying an additional iguana.. The Nachshon Junction and the Shimshon junctions are both near Bet Shemesh, major junctions on the Highway 44. Nachshon and Shimshon are probably about 7 kilometers from each other (estimate). It seems they are closer together than just in proximity. 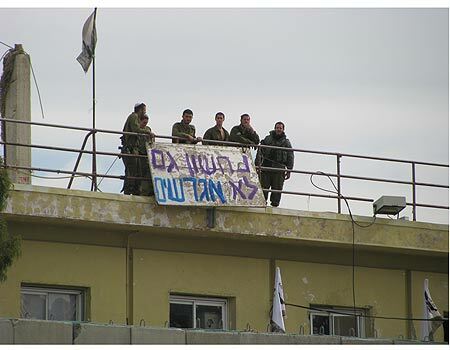 The Shimshon Battalion recently held a protest during a ceremony in which they declared they do not take part in disengagements. 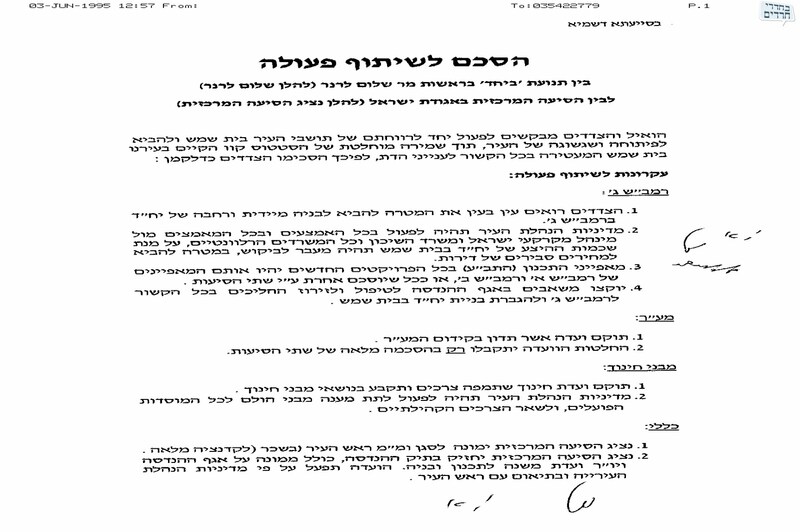 Now the Nachshon Battalion has also declared that they too will not take part in disengagements. I reported once before about rumors that were cropping up regarding possible graves in the construction zone of RBS C/G/3, and that they might cause trouble with the expansion plans of Bet Shemesh. Everybody in City Hall, and I had asked a few, at the time shrugged it off saying there is nothing to worry about - it is just a rumor, not really a problem, etc. It seems that the rumor is becoming more serious. Kikar Shabbos is reporting that graves have been found, and while archaeologists say that they don't expect there to be more than just a few graves (which might not even be Jewish), the Asra Kadisha people say they have information about there being a lot more than what is being discussed openly. They do not trust the politicians or the archaeologists, and no land will be released for construction until they give the approval. And if that is not enough, the Ministry of Interior might be canceling the tender for City Spokesman that was won a year ago by Mati Rosenzweig. The MOI is claiming that Rosenzweig does not meet the necessary [academic] criteria for the position. The newspapers are all making a big deal out of Rav Chaim Kanievsky's recent statement regarding Arabs. An avreich approached Rav Kanievsky the other day and asked for a bracha that he should be successful in his upcoming court case. rav Kanievsky asked why he is going to court, and he answered for hiring Arab workers (illegally I presume). Rav Kanievsky refused to give him a bracha saying "you deserve whatever you get. Don't you know it is prohibited to hire Arabs because they are murderers?... whoever hires them deserves the punishment"
The papers are comparing it to a past statement of Rav Kanievsky in which he also then said that Jews should not hire Arabs because they are murderers, and claiming racism. Personally, I prefer to compare it to a different statement of Rav Kanievsky, and rather than claim racism, I would say Rav Kanievsky is in favor of personal responsibility, reward and punishment, etc. In July, a yeshiva bochur came to Rav Kanievsky for a bracha for his court case regarding a car accident he had been involved in, and he had been driving with no license. Then too Rav Kanievsky said he deserves the punishment for driving with no license, and he could not make any such claim that he knows how to drive if he was not trained in it. Personally, I think this new statement fits with that old one. Rav Kanievsky believes that people should be held accountable for their actions. You drive with no license and get into an accident - you are a murderer and should be punished accordingly. You hire Arab workers illegally, they are dangerous and you should be punished accordingly. Just because you are frum does not give you a free pass to break the law. The law is in place to protect us (most of the time at least). You get a drivers license because it means you were trained in operating automobiles. You cannot hire any illegal worker you want because the State needs to verify which Arab workers are safe and can be trusted and therefore hired, and which might be dangerous. Rav Kanievsky is not a racist. he just believes in personal responsibility. A double qotd today, both regarding the Palestinian "threat" of unilaterally declaring statehood. The Palestinians should respond positively to the peace offer that the government under my leadership offered to them. They will not receive an offer better than that one - the balls is in their court. The situation is much better than the way it is being described. The visit of the PM was very good. There is an attempt to create an atmosphere of despondency, in order to force a political process. Just like what happened in 2005 with the disengagement - and we see where that got us. The Palestinians do not need to threaten us with unilateral steps. We can also take unilateral steps, such as annexing Judea and Samaria. The Prime Minister does not negate negotiations, but he has principles. Mazel tov to [future rabbi], Israeli boxer, Yuri Foreman upon winning his boxing match against Daniel Santos on motzei shabbos and took the superwelterweight championship title. It is pretty boring. They dance around each other a lot. They need to throw far more punches in this sport. and here is an interview with Foreman that took place last year.. If you were there, thank you for coming and being part of it. We had a great, and meaningful, Bar Mitzvah weekend, starting from Wednesday and extending through Shabbos. It was a lot of work, a really lot of work, and in the end it all worked out great. My wife gets most of the credit, as she is the one who arranged and prepared most of it. I kinda just made sure not to get in the way too much. Wednesday night we had a seudas chaveirim for his class, and then invited a few friends and relatives for dessert. This was a seudas mitzva because it was the actual birthday. Thursday morning, we went to Chevron to daven shacharis. The parsha being Chayei Sara, in which Avraham purchases the Me'aras HaMachpela in order to bury Sarah, makes this a very special period in Chevron. We could not go for shabbos, so we went on Thursday for davening. The Bar Mitzvah boy leined in the Me'ara, and we brought some burekas and juice which we shared with the soldiers after davening. Shabbos we had the shabbos meals with our family and guests who came in for the Bar Mitzvah. Friday night we fed abot 35 people in our house. Shabbos morning was the big day, with the bar mitzvah boy leining the parsha. He did a fabulous job, and I, surprisingly, had not chased away too many people with my butchered rendition of leading the shacharis services. After davening was a grand kiddush in which lots of people showed up from all over the neighborhood to say mazel tov. Near the end of the kiddush I ran out to say mazel tov by the bar mitzvah of a friend. After kiddush, we had lunch for our family and some additional cousins, totaling about 50 people. After having a few too many l'chaims with afew too many people, I think I was seeing everything in triplicate, so it looked like there were 150 or so people at lunch! We were going economical, so my wife cooked everything and nothing was catered. That was a ton of work on my wife, but it came out beautiful and everything worked out much smoother than expected. Now it will take a few days to get our house back in order, but the return to a daily, normal, routine looks like a possibility in the near future.. I will post my divrei torah from the bar mitzvah a bit later. The media is all about the current Palestinian threat that they are considering declaring statehood unilaterally. What do you think Israel should do if it should happen? I think it is a fairly good idea. Negotiations are going nowhere, and have not gone anywhere for a long time. Now we are not even talking. From the viewpoint of the Palestinians, they have world opinion pretty much on their side and will support such a state, for the most part. From our viewpoint, I see it not making much of a difference in anything. The benefit I see is that if they are an independent state, then we can respond in kind to any hostilities started by the State of Palestine without having to worry about world opinion (in a dream world of course) as any hostilities would be by a country, and not by an oppressed, occupied people. Also, I see it as a way to keep them out. if they are a separate country and not an occupied people, perhaps we can keep them out of Israel. If they want in, they should have passports and visas. If they want to work they should be required to get work permits, like any other foreign worker. I see it as a win-win. That is, if Israel will be willing to implement such policies. If the desk has no entry for anybody, even employees, who is it for??? This sign is in a supermarket hanging beside the bread slicing machine. 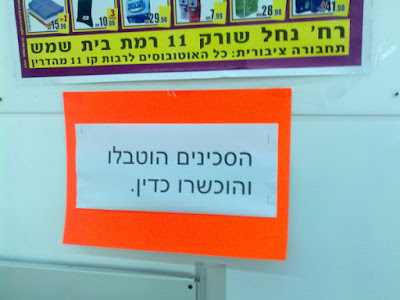 It takes for granted that people would not, or did not, trust them (by them I mean the proprietors of a frum-owned supermarket) to have done it, and were probably repeatedly bothering the store employees with questions as to whether or not they had been toiveled. We fought with the battalion in Gush Katif, in Netzarim, in Nisanit. We are part of the family of fighters, where everybody knew who was the enemy and how to relate to him. The occupation of Shimshon officers and its soldiers in recent months with political whims and impulses on the ruins of Chomesh in the Shomron, in outlooks and chases after Jews with war cries as if they were the greatest of terrorists - these cause us great shame.... It is no great wonder that soldiers complete basic training look with trepidation to their future in the army as they finish the course, as they are concerned their talents and skills will be used to perform politically based missions that they have no connection to security needs of the State of Israel. 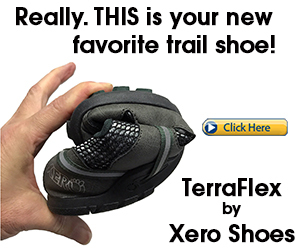 This causes us to take steps that are unusual, in an effort to fight against this trend. Did Jack Teitel kill them or not? I don't know what the story is with Jack Teitel. Did he do it or not? I have no idea. He was arrested for having weapons illegaly, and then it turned into charges of various murders and attempted murders of both Arabs and left-wing jews. But did he do it? It seems it is not so clear. They have absolutely no proof that he was the murderer in any of the murders he admitted to. One might think his admission might be enough, but it might turn out to be not enough. He is starting to deny his involvement in some of the cases, claiming he lied (coerced?) under interrogation. I don't think he denied them all, but it might come to that. Anyway, without proof they might not have much of a case. In the meantime, all they are charging him with, according to the article in todays newspaper, is bearing unregistered firearms, incitement, and threatening behavior. As I said before, this story interests me because he was a former classmate of mine. If he doesn't get hit for the murders, he will no longer be my most infamous classmate, just the most famous. I don't have time to translate this right now, but the group of rabbonim met to review the shabbos elevator situation. Bechadrei has published a document with the protocols from the meeting. The committee of rabbonim, led by Rav Efrati, as decided that most shabbos elevators can be used, and for sure when the situation is elderly people, sick people or others who would have great difficulty using the stairs. Rav Efrati even says that Rav Elyashiv has always supported the hetter, until recently, though he does not say why Rav Elyashiv's opinion recently changed. Perhaps it is because of the issues raised by the technician that started the whole debate. video of the recent Sanz Klausenberg wedding. I didn't know they did the mixed dancing thing.. The newspaper reported that Rahm Emanuel will soon be coming to Israel - in about 2 months - for his sons bar mitzvah. 1. A new blog by a kitchen/cooking hobbyist called Kishy's Kitchen has what looks to be like a great burger as his first post. Great start! 3. The Yeshiva Guy found holiness in Haifa. 4. Hadassah has an interesting question about how we would relate to someone like Avraham nowadays, and how they did then..
5. Not Brisker Yeshivish gives a bio on the recently deceased legendary Rosh Yeshiva Rav Elefant. Welcoming Olim gives a short bio on the Klausenberger Rav. 6. I naturally hate the NY Mets, as I am a Cubs fan. We will never forget 1969 (even though I was not yet even born). But this might be as close as they can get to making me forget it. Muqata points out the Mets will be hosting an evening for the Hebron Fund. The latest pashkevils in Yerushalayim are supporting Elior Chen. They must believe only the graphologists who say his handwriting indicates he is a real swell guy. This is the final round of the fight between David Haye and Nikolai Valuev. The size difference between them is amazing. This was billed as a fight between David and Goliath, and David won. Another fight that was also billed as a fight between David and Goliath, and also featured a tremendous difference in size between the two contestants, was the fight between Rocky Balboa and Ivan Drago. The fights are very similar, with each one being won by the David. My opinion is that the Rocky fight was much better. He actually beat Drago, and didn't just win by a couple of points. There is something I don't understand about the planning for construction in RBS C/G/3. Many groups are no vying and positioning themselves for winning the rights to build on various plots. The haredi media ran many articles in the recent weeks about the issue, and this one item is quoted by all the askanim and rabbonim involved in discussing the issue of preparing for the tenders. That is, they have all said that if any kablan thinks he is going to make money off the backs of haredi avreichim, they will end up with no houses sold. The haredi housing crisis is not just a business, but is a national mission to be resolved. They will not accept anybody trying to make a buck off their backs. I don't understand why a kablan would build knowing that the community he is building for has no intention of paying him any reasonable level of profit. No kablan builds as charity. This is their business. I don't know if anyone has the power to stop it from happening, but just the attempt seems unreasonable. While it seemed like the elevator issue was pretty final, with some technician raising some issue with rabbonim including Rav Elyashiv, claiming that because of the issue shabbos elevators should be assur to use. Based on that, the rabbonim came out with a conclusive psak completely banning the use of shabbos elevators, even in the most b'dieved situations saying that it is pure chillul shabbos. It turns out it is not so clear cut and we might not yet have heard the final word. Bchadrei is aware of a meeting of rabbonim, instigated by a concerned rav who is director of the Technological Institute for Halacha. Rav Halperin is concerned with the severity of the psak, considering as he says, the technician who raised the issue "does not know his right from his left". A team of rabbonim have been meeting to go over and analyze the variou sissues of the elevators and their ramifications. The team is headed by Rav Efrati, Rav Elyashiv's right hand man and a leading Rabbi in Jerusalem. the question of pikuach nefesh. People who are not well who relied on the elevators and are now physically walking up flights of stairs putting their health in danger. bein adam l'chaveiro - people bought apartments based on the knowledge that they had working, kosher, shabbos elevators. The fact that they will no longer be allowed to use them is a serious damage to them. Rabbonim who have previously paskened the elevators were kosher might have liability because of changing their psak. Supposedly Rav Elyashiv would be immune from this because he is like a "free craftsmen" offering his opinion, but others who receive salaries will likely be legally liable for any monetary damage caused by their changing their opinions. Rav Shubaks, a dayan involved with the team of rabbis, has requested based on the 3 reasons listed above that the psak be changed back to allowing the use of shabbos elevators. Rav Elyashiv agreed to convene the group of rabbis to meet and analyze all the issues, and come out with a final decision in the coming days. The GOP is attacking the Obama Health Care plan as presented by Nancy Pelosi - the thing is a whopping 1990 pages long. Or as they are putting it, it is 5 times as many words as the Torah. In the latest edition of the publication "Dvar Hashem - Zu Halacha", there are a number fo questions that were asked to, and answered by, Rav Elyashiv. One of those questions is if there is anything to the common custom of somebody in need of salvation davening 40 days in a row at the Kotel - is there any inyan in doing this? Rav Elyashiv's answer is that there is no basis for this. Any time, and every time, one goes to the Kotel to daven his prayers are accepted. There was a great and very moving story in the Mishpacha newspaper that I want to share with you. The article was about how more and more doctors are performing bris mila in hospitals, and how it is a dangerous but growing phenomenon. They spoke to a young mohel (23 yrs old) who works as a mohel in the army. Many of the circumcisions he performs in the army are for soldiers of Russian background who are uncircumcised who now want to get their bris. The mohel told a story about a recent bris he performed on a Russian. The soldier tells him that in the Soviet Union there was a mohel who was moser nefesh to perform the bris on as many children as he could, secretly of course, putting his life in danger. if he would be found out, it would be a death sentence for him. One day he receives a message telling him to arrive to a certain building at a certain address. he thought to himself that the gig is up. he has been found out and he is about to receive his punishment for the crime of performing bris mila in the Soviet Union. He goes on the designated day to the address specified. He is met in the building by a senior KGB officer. The officer tells him we know what you have been doing, performing bris mila on Jewish children. We have brought you here because we are a group of officers who want bris mila performed on our children. The officer brought the stunned mohel into a room where there were 10 other officers and a bunch of children and babies). The soldier concluded the story in tears saying he is the child of one of those babies who had been circumcised in that room by the mohel who was moser nefesh for mila, and now he wants a bris. Abbas retires - who cares? On Friday PA President Mahmoud Abbas announced that he would be stepping down come January and not running for re-election. After the initial announcement, everyone in the media went into overdrive trying to figure out what that meant - why he announced it, is he serious, is just trying to put pressure on Bibi and/or Obama, can he be talked out of it, what it means for the future of the peace process, etc. I say, who cares? What has he done anyway? He advanced the peace process even less than Arafat did. He accomplished absolutely nothing in his years as PA Prez. He lost half of the PA territory to Hamas, he never even got talks to nearly the point Arafat got them in his day, he did not bring any sense of stability or hope for the future to his people. He accomplished nothing except for keeping the PA in almost a holding pattern. 1. Muqata covered the IDF press conference about the boat they caught transporting weapons to Hezbollah..
2. Rabbi Fink posts the NBC ad for the Olympics that uses Matisyahu's new hit song "One Day". That is simply amazing. Kol HaKavod to Matisyahu for his continued success. 3. Frum n Flippin describes her relationship with her blog and how it and she has developed in its wake. 4. The Yeshiva Guy describes the tummult of the beginning of a new zman in yeshiva and looking for a chavrusa. 6. What would you do if you found out something you owned and used regularly was connected to the Nazis? How to be Israeli has that exact dilemma right now and is trying to figure out what to do. 7. Wow. They couldn't wait a bit and miss a few innings? they had to watch the game during the chuppa? very rude. As you may know, Wednesday night there was a town council meeting in Beit Shemesh. The meeting was legally forced upon the Mayor by seven city council members who raised a motion to nullify the agreement to divide RBS Gimmel into three parts and to begin the planning of RBS Gimmel from scratch. "Not too long ago we commemorated the yarzheit of Prime Minister Yitzchak Rabin. The way the religious Zionists in Bet Shemesh have been speaking against the hareidim, reminds me of the inciting words which led up to the assassination of the Prime Minister." He was immediately shouted down by the reporters and city council members who were in the room but this disgrace must become known by all." Such incitement by the Mayor (who claimed he would be mayor of ALL residents of Beit Shemesh when he was elected) against one segment of the community is bad enough. However, what he said turns the problem here on its head. 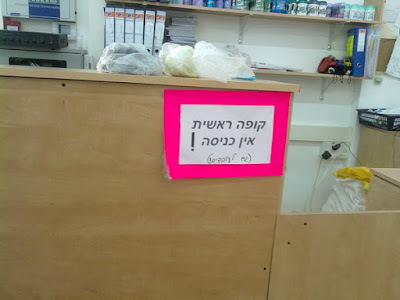 The Dati Leumi, secular and many in the Chareidi communities in Beit Shemesh are literally under siege from a minority of religious fundamentalists who have the outward appearance of "Chareidim". I am surprised he would say something like this. The Mafdal ad its supporters, as does anybody else, has a right to protest anything in city government they do not like. they tried to bring it to a vote and it failed. that does not suddenly make them into assassins or supporters of violence. Abutbol is forgetting that it was not just the religious zionists, but all the right wing, including and especially shas and other haredim, who were, and are constantly being, vilified as being responsible for creating the atmosphere that led to the murder of Rabin. There is no reason for him to go this route just because he doidn't like the political maneuver they tried to pull. And where are your classmates today? How do you ever know?